Power floor ILIFT Plus with power base - SHIPS FREE! Power floor ILIFT with manual opening base - SHIPS FREE! Ilift 450 Power Lift, manufactured by, Invacare is a patient lift designed to handle the most common patient transfer situations easily and safely. This patient lift has all the features that you would expect from a premium lift without the premium price. Some of the features with this product include increased maneuverability, intuitive ease of use, and enhanced safety features. The Maneuverability with this item makes it ideal for caregivers due to it's low base clearance and small turning radius. It features an ergonomic dual angled push handle that allows caregivers of all heights better access to both sides. Premium casters and base design on this product decrease the amount of force required to push and pull the lift. The amount of force can be decreased by as much as 60% making it perfect for quick access and use. This product is designed with safety in mind. The Ilift is manufactured with a sleek European design with no exposed pinch points. It's integrated anti-entrapment feature will automatically stop the Ilift if it meets any kind of resistance when being lowered. The Invacare Ilift features ease of use operation. The power plus model includes a power base that makes the wide base opening effortless by the push of a button. The manual model features an adjustable base. Both lifts are manufactured with a protective powder coating finish on the legs and base. This protective coating makes the item easy to clean and disinfect. An additional feature of this product is the slim, lightweight and ergonomic hand pendant. This pendant shows clear symbols and makes operation of the unit easy. 2 Batteries and a remote are included with this product giving you the option to charge one battery while the other one is in use. 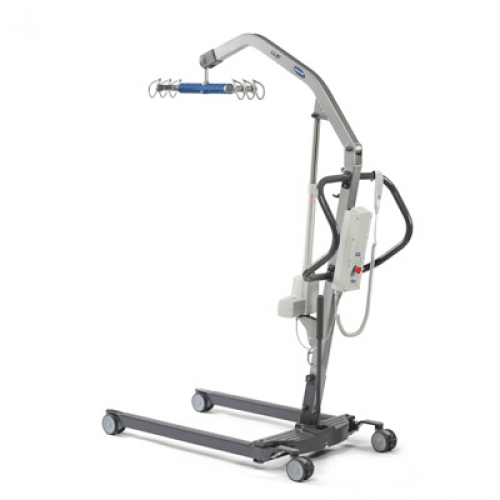 BUY Invacare 450 Power Patient Lift from Vitality Medical today. Low friction casters and dual precision bearings. Innovative swivel bar with double loop aluminum safety clips to provide confidence that slings are firmly attached. Ergonomic dual angle push bar with symmetrical design. 360 degree rotation for enhanced safety and maximum flexibility positioning residents. Integrated base cover to provide excellent protection against wear and tear from dirt, moisture or accidental damage. Base width: Open 37.4" Closed 27.8"
This video is not a replacement to your Owner’s Manual. Please refer to your Owner’s Manual for additional information. The Invacare Brand promise of making life’s experiences possible is realized through innovative products that provide enhanced mobility, safety and dignity. Invacare is proud to introduce the next generation of full-body floor lifts, the new Invacare I-Lift series. These lifts offer caregivers and residents comfort and safety they need, whether they are in acute care, long-term care or home care. Designed to handle the most common transfer situations, Invacare’s I-Lift series with the 450-pound capacity will accommodate up to 98% of all your residents. The Invacare I-Lift series consists of a Power Model with manual base and the Power Plus, which is a power lift with power base and a suite of new electronic features. With an intuitive design, the new Invacare I-Lift is set apart from the competition in three key areas; Safety, Ease of Use and Maneuverability. The Invacare I-Lift series is packed with features to help transfer residents safely in a variety of different situations. Low-friction casters and dual-precision bearings provide a smooth unsurpassed maneuverability that requires 60% less force to push. A unique integrated base cover provides excellent protection against wear and tear due to dirt, moisture or accidental damage. Adjustable legs make it easy to go through doors, around furniture and to maneuver in tight hallways. 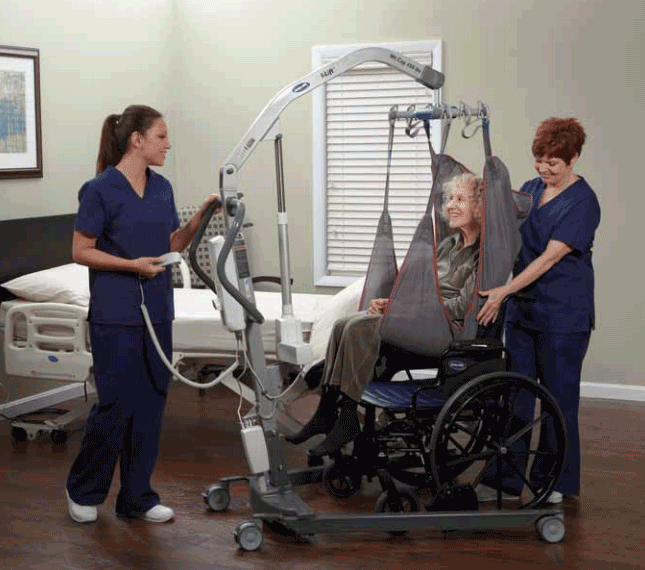 The Power Plus model features a power base that simplifies operation and helps reduce caregiver strain. As we move up the mast, you see the Invacare I-Lift series has a dual-angled push handle to better accommodate your height and allows access to be pushed from either side. The Power and Power Plus models feature an ultra slim lightweight and ergonomically designed hand pendant. This control allows you to operate the lift while at your resident’s side with simple, easy-to-understand symbols. The Invacare I-Lift Power Plus also includes a battery life indicator and service light. This service light provides convenient visual cue when service is due. The all-new hanger bar design has double loop aluminum safety clips, a polyurethane wrap protective cover and it can rotate 360 degrees for maximum flexibility and positioning your residents. For added convenience, the Invacare I-Lift series features a unique foldable design for easy storage when not in use. With a sleek European look, the Invacare I-Lift series is third-party certified to comply with the international standard for lifts. The Invacare I-List series has been designed from the ground up to meet your needs while making life’s experience as possible for residents. 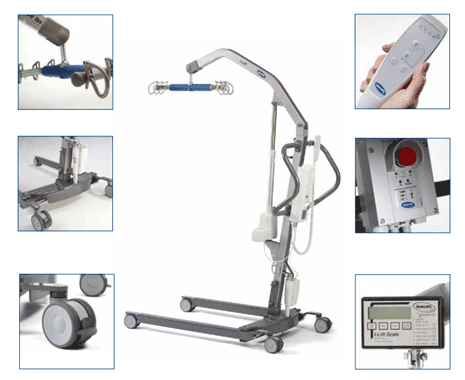 Make the Invacare I-Lift series an integral part of your safe patient handling program. Invacare Lifts and Slings, an industry leader.